Last week, members of the Southern Branch of the Russell Society came to visit the Museum. They especially wanted to see some of the minerals in our collection that came from the South Coast of England. The Russell Society, in case you are wondering, runs lectures, museum visits and fieldtrips for people who enjoy finding out about minerals. It is named after Sir Arthur Russell, one of Britain’s most gifted amateur mineralogists. I’m a member and so is one of our volunteers, Jane Randle. Now, Jane and I know the Russell Society folk are a very knowledgeable lot, so we put our heads together a devised a challenge for them. We got out from the stores a whole lot of interesting minerals from quarries, mines, beaches and cliff exposures all along the coast from Kent round to south Devon, and laid them out in a random way. Then came the fun bit; we took away all the labels! The task was to work as a team and organise the minerals according to where they were found, from west to east. Easy? Well, that depends on how good you are at recognising the different kinds of minerals and where they come from. One of the fun things about minerals is that each kind – calcite, quartz, gypsum, etc, – can look very different according to where it is found. Some are very easy to recognise but some are not. After much debate, looking at maps, and rearrangement of specimens came the moment of truth as Jane and I put the labels back with their specimens, and everyone could see whether or not they were right. Our Russell Society folk certainly showed they know their local minerals! They recognised the little round masses of baryte crystals from the Isle of Sheppey, large transparent gypsum crystals from Battle, powdery white masses of aluminite from Newhaven, rare blue vivianite crystals from near Southampton, sparkling pointed crystals of calcite from Charmouth, branching crystals of real gold from near Torquay, and many more. Others did elude them, and came from surprising places. Our beautiful polished slices of fossil sponges, for example, came from pebbles collected on Brighton beach in the 19th century! As you know, the Museum of Natural History is closed to the public throughout 2013 for restoration work on its leaky vaulted roof. Although our central galleries are thrown into shadow, there’s still plenty going on behind closed doors. Expert staff from the museum’s collections will be your guides; see where fossils get fixed, explore the high-tech kit used to see inside minerals and even meet the oldest pinned insect in the world! I’ll be there on the day and would love to meet some “Darkened” followers. Don’t forget to book your places through our What’s On page. I had a magical day of wonderland adventures recently. Each year Oxford celebrates one of its favourite literary daughters with Alice’s Day, a festival of theatre, art, stories and general silliness that takes place throughout the city. As we’re closed this year, we couldn’t join in on the day, so we decided to do something special in the run up. Along with the Story Museum, Christ Church cathedral and Blackwell’s, the Museum has created the Alice Team… or A Team! Our mission is to show Oxford’s children what an inspiring city they live in, tell them tales of Alice in Wonderland and help them create something fit for an imaginary world. With this year’s Alice’s Day theme set as nonsense, we created a project called Dodo Loco. Dodos may be extinct, but we certainly tracked a few down on our hunt around Christ Church. Children from Larkrise, East Oxford and St Ebbe’s Primary Schools joined us for an exciting behind-the-scenes trail, visiting special spots like the rooms where Lewis Carroll (aka Charles Dodgson, or Dodo Dodgson) lived, and the lawn where the real Alice (Alice Liddell) played croquet. Along the way, they tracked down nonsense words dotted around the college and cathedral. Once we were fired up and had soaked up the atmosphere of Alice in Wonderland, we all marched over to the Story Museum for the next stage of our Alice adventure. The 120 children (and the A Team members) were treated to a spectacular nonsense poetry workshop by the fabulous Michael Rosen. He got everyone laughing and moving as he performed some of his own poems; my favourite was Hand on the Bridge and I really recommend watching this video for a glimpse of his style. Then, using the words gathered around Christ Church and lots of ideas from the children, he created some more hilarious nonsense poetry, before handing over to the children themselves. I must admit to being enormously in awe of Michael, so it was great to see how patient and warm he was towards the children and even the adults! He joined my group for the tour around Christ Church, which was both exciting and quite nerve-wracking! He was great, though, joining in with the activities and even telling me a few extra stories about the Alice in Wonderland characters. Here I am with Michael, enjoying another inspiring story. More Dodo Loco updates coming soon! We have a new blog in the Museum of Natural History family! Once in Whale is an exciting new site all about our whale skeleton conservation project. Visitors to the Museum will remember being greeted by an enormous jaw bone, which belonged to a sperm whale. Exploring further you would have seen spectacular skeletons suspended from the roof. After over 100 years on display, the whales are unsurprisingly looking a little worse for wear. Dust, decay and water that dripped through the roof have all taken their toll. It’s time for a bit of TLC and the Museum’s year of closure has provided the ideal opportunity. So, who is behind this conservation project? The team is headed by Bethany Palumbo, Conservator of Life Sciences at the Museum of Natural History. Donning her hard hat to work alongside Bethany is Gemma Aboe, recently appointed as Assistant Conservator. So far, there are just 2 posts up on the Once in a Whale blog, but already I’ve learned a huge amount about whales and their conservation. For example, did you know that the Lesser Fin Whale is the second longest animal in the world?! Each post by the ‘whale team’ will tell you about the different whale specimens involved and the conservation treatments they’ll be experiencing. Keep following for progress updates and to see the big reveal of the finished sparkling skeletons. At 9pm today BBC2 is broadcasting The Other Pompeii: Life and Death in Herculaneum, a documentary following The Herculaneum Conservation Project, which aims to find out what life was like in the small Roman town of Herculaneum, moments before it was destroyed by the famous eruption of Mount Vesuvius in 79 AD. This project involves work both in the field and in the Museum by our Environmental Archaeology Unit, led by Mark Robinson. One of the problems faced by the conservators at Herculaneum is that they need to remove rainwater from the site. To this end, a Roman sewer was to be excavated so that it could act as a conduit for new plastic drain pipes. The Museum’s Environmental Archaeology Unit was brought in to investigate the contents of this sewer for evidence of Roman diet. Biological remains from Herculaneum were transferred to the Museum for detailed analysis by Mark and Erica Rowan, a doctoral student in the Environmental Archaeology Unit. The numerous fish bones, sea urchin fragments and so on suggested that the occupants of the town enjoyed a varied marine diet. There was also evidence of the plant component of their diet, including a major consumption of figs and the use of food flavourings such as coriander and even black pepper, which would have been imported from India. Remains of fly pupae suggest unhygienic conditions. Look out for more on this research, including footage filmed in the Museum, in the BBC 2 documentary tonight. The programme is being broadcast to coincide with the opening of the Life and Death: Pompeii and Herculaneum exhibition at the British Museum. The Behind the Scenes Tours are now in full swing. Hosted here at the Museum on Tuesday afternoons, from 3-5 pm, they offer a unique look at what our collections staff get up to in their day-to-day work, as well as a rare opportunity to see items from our specimen and archive collections that are not normally on exhibit. 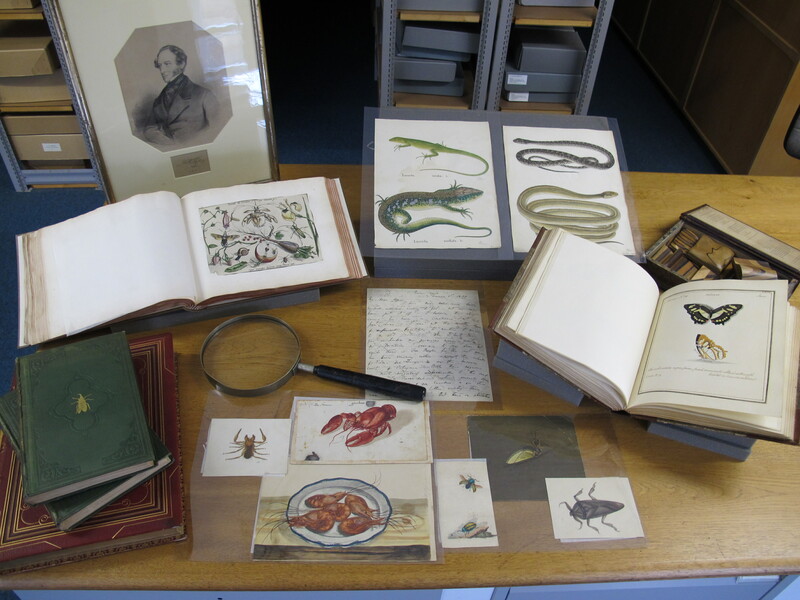 The first Treasures of the Archive tour took place last week and offered a beautiful display of some of the oldest and most important items in the archive collection. It included, among others, the original 18th century manuscript known as the Jones’ Icones, which features hundreds of exquisitely detailed butterfly paintings, a letter from Charles Darwin mentioning of his voyage on the Beagle, and William Smith’s personal copies of his Geological County Maps. There will be two more opportunities to join this great tour, on 2 April and 21 May 2013; but with tours being offered by every department there are sure to be many more that will catch your fancy. There are even tea and biscuits at the end! Tours can be booked through the University Online Shop and are only £5 per person. Coming up in the next few weeks, we have the first of the Entomology Highlights Tours, behind the scenes in Zoology, and a special themed tour centred around female fossil hunters Mary Anning and Elizabeth Philpot – all sure to be a great afternoon out. To see a complete listing visit our website. If you have a group that is interested in any of our Behind the Scenes Tours, but you cannot make the advertised times, please contact info@oum.ox.ac.uk to discuss options for private tours.